Dover’s “Build a poster” series is a bit different than the other Dover books I’ve reviewed here. 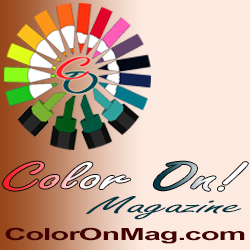 Every page in the book connects with all the other pages to create one 44″ x 47″ poster. As with the Creative Haven series, each page is single-sided and perforated for easy removal. The designs are hand-drawn by the artist Jan Sovak to create an underwater scene filled with all manner of sea creatures, and even a sunken ship with treasure. 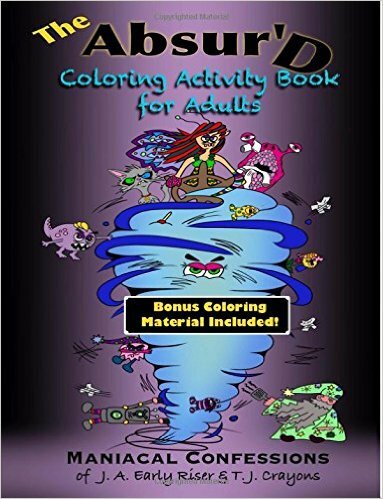 When this book first arrived, I admit I was a bit disappointed, and was ready to say it was not a great book for the adult colorist. Most of the pages I would consider too simple even for a beginning adult colorist, with giant spaces to fill in and fairly thick lines. But then I had a thought that changed my thinking about this book. While some of the pages in the book are very simple, others are fairly intricate. I think this book and others in the “Build a poster” series would be ideal for a family project. 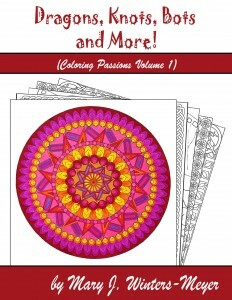 Younger children can color the simpler pages, while older children and adults can tackle the more complex designs. I think it would be really interesting to then take all the individual pages and see how they connect to form the full design! Dover really thought through the layout on the book. The back cover shows all of the pages colored and assembled, but with a single 1 pixel space between them so you can see how the individual pages are constructed. Then, on the inside cover, the full image is shown again, but this time without the space. A small instruction box also gives you ideas for how to assemble the poster for display. On the inside back cover, they’ve provided individual images of every sea creature in the poster, identified by name. These can be used to look them up and see what colors to use, or even as an educational opportunity to learn more about the sea and what swims in it! I think this series really shows the years of experience Dover has in providing fun educational books for its customers.